I love this bike. Where can I get parts? Don’t want to bother with the same questions, but I really like what you have done to this bike. Is there any way you can email me a price list for all the custom parts added and can you provide any info on how to add the larger wheels. Really interested in the exhaust, seat, and rear fender setup. Thanks for your time and keep up the hard work. Also, will you be selling other parts, such as the exhausts? Would like a set of exhaust you did for the The Iron Guerilla. Can order a set? hey Winston, fantastic work…Love to buy some parts from you, just what I’ve been looking for and I didnt think it exsisted until now. I’ll be in Taipei start of Jan 2012 for a few days. Would like to visit your temple and bathe in it’s glory. Is it possible to make an order of some parts before I arrive…? When beginning, it is from Japan. The motorcycle that you made is wonderful. I also have gotten on the iron. I want to buy the seat and Air Cleaner of the iron of you ROUGH CRAFTS. Can you send it to Japan? is the rear and front tire coker 5.10x 16 available in your store? Congratulations for you and your perfect fat original project!!!! 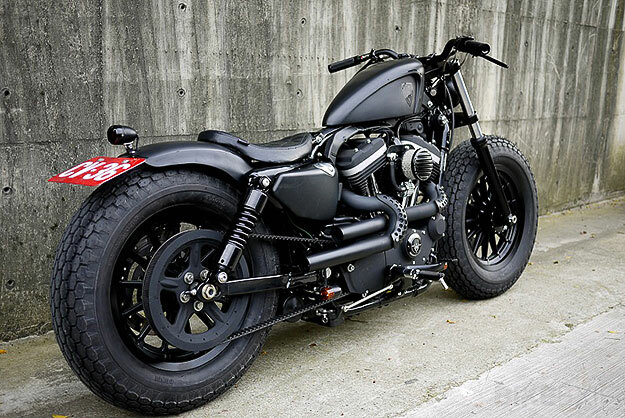 Epic craftwork transforming the sportster into The Iron Guerilla-totally sick!. 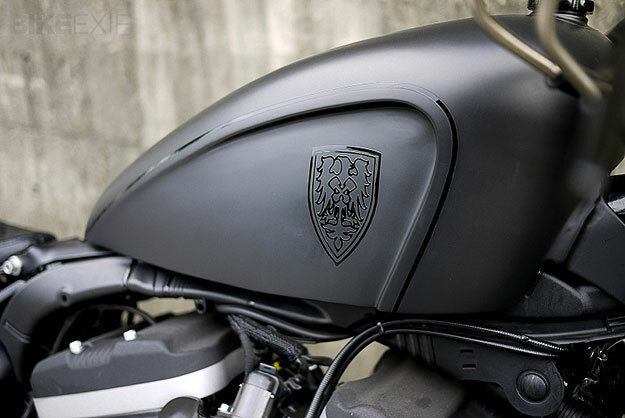 So can you hook me up for details,parts and price or do you intend to make this a one off inspirational iconic talisman?.I would be proud and honoured to badge your emblem of superior craftsmanship.Keep the excellent work up dude. Hello, I’m Paul and I write from Italy. I would buy one of your seat. Paul, the email you left fail to go through, is there another one? Please send me the details of all the parts and components you have changed in it and how i can customize it exactly the way you have, how can i buy the parts from you and their prices. This is probably the best customized job on a bike i have seen in a long time. Hi man love the triple trees you put on the bike. Would like to buy them. Please tell me where to get those from ! I love this bike. I have a 2006 1200r that I would like to make look just like yours. Would it be possible to send me a list of parts needed? May I order some parts? This bike is absolutely amazing. Please send me the details of all the parts and components you have made on this bike and how i can customize it exactly the way you have it shown. Can you please provide the prices as well and a contact to order everything. I have been waiting for a long time to see a custom bike like this. Thank you for your vision. How do I get one of these if I am in Chicago? Do you ship the parts? Or how does it work? I would like to get one of these Guerillas. Beautiful bike, Winston. Interested in ordering parts, can I get a price list. Particularly interested in the exhaust and air cleaner. Thanks for posting the pics! Kudos once again, and I look forward to hearing from you. this Bike is absolutely amazing. me being in the navy i find it hard to find the time to make my 883 look like this beautiful peace of work. and am definitely in love with the tires on it. is the any way possible to get work like this done on my bike? and how much? im currently in san diego california. please let me know highly interested.thanks winston. I would like to keep in touch with you please.Best regards;jc MATHORE from NEW-CALEDONIA. I absolutely love this bike! 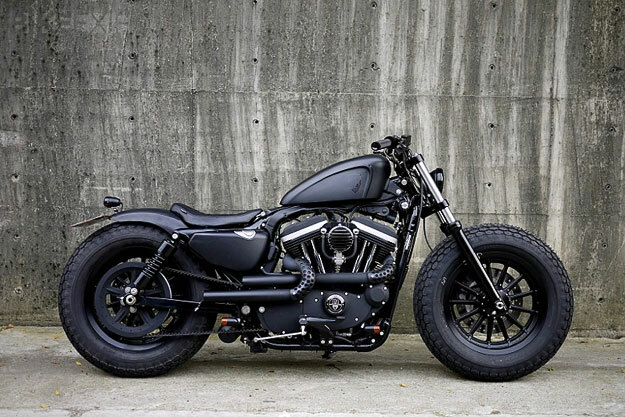 I Just brought my Iron 883 and would love to do something exactly like this on my bike. Could you please send me a price list for all the parts for that bike. Thanks alot! I am interested in ordering some parts sor my 09 Iron. I already has handmade exhaust and air cleaner. I was looking for the look you have done and would like to have a chance to own parts from this bike. 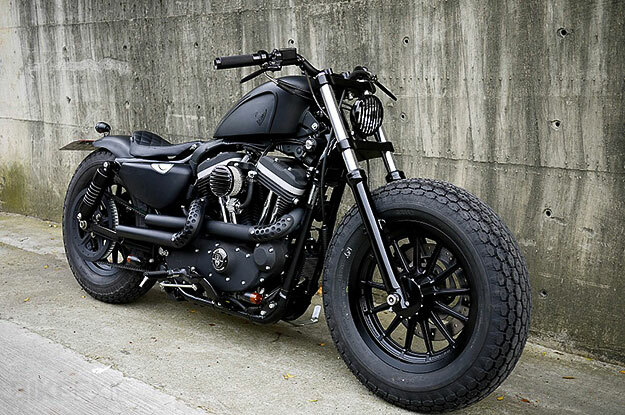 The US needs to take some lessons on how to make badass Sportsters. Great bike can’t wait to see what is next. This bike is essence of BADASS!!!! I’m in the process of modifying my Iron and want this look (16 inch front wheel).I just completed the stage 1 (1200 CC) upgrade and forward controls. Every Harley dealer and local shop in the US says I’ll have to change out the entire front end. I don’t mind however, am interested in your pricing to gauge an estimate. Thanks for your help and great work. Also how do I order your parts, pay, shipping Ect?? Is it possible to arrange the shippment ti switzerland and how i can pay to you ??? Thank in you advance for you reply. Beautiful bike – How can I get those mid-glide triple trees? I have an 08 XL1200N Nightster I have been wanting to put a fat front tire on since I bought it. Do you sell them I hope? Hi guys i’m going mad. There are two weeks that I am looking for some stuff you used in your 48 custom. I need the gold handgrips and footpegs. Can you write me where i can bought them or their price? 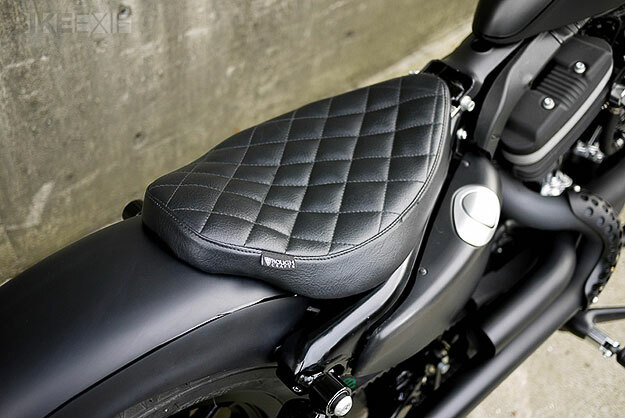 I’m interested in the Diamond stitched solo seat for my 2011 Iron, can you ship to Italy? Thank you in advance, bye. Can these parts be purchased and sent to the US. If so how much? can you tell me the price to send them in France ?? 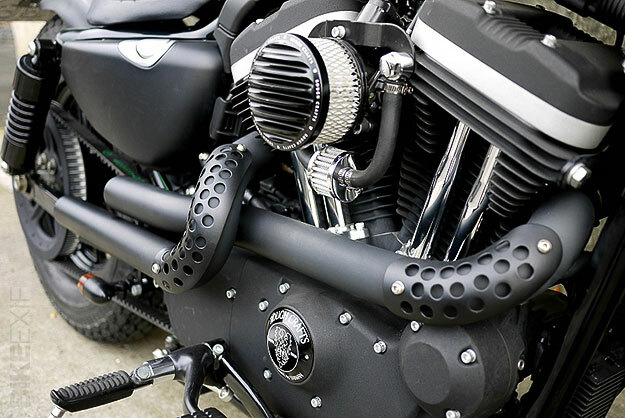 Awesome Sportsters you are building Winston! You have a store on your website but I was not able to find a way to make a purchase. Do you ship to the U.S.? Please let me know if it is possible to buy one of your seats. Thanks. Hi Winston, i would like to ask you some prices of some parts on Guerrilla….can you give me one your e-mail contact so i can send to you my request.Thank and regards. My names Ryan Sealey from the UK , Love your design on this bike really makes it unique.I’m not interested in buying parts, but am more interested in buying the whole bike from you, may even pop out for a week to do a little site seeing at the same time if this at all possible?